Which one makes a better fake diamond; a white topaz or a white sapphire? As we travel along on the fake diamond road, we come to discover just how many options are out there in gemstone world. Any clear gemstone with durability, brilliance, quality faceting and a proper setting can make a beautiful engagement ring or wedding set. 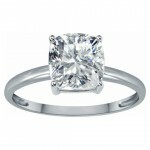 So far, I have explored rhinestones, Swarovski crystals, Cubic Zirconia and Moissanite as diamond alternatives. Today, I want to take a look at those gemstones that come in every color of the rainbow; sapphires and topazes. Mother Nature creates many clear versions of what we recognize as popular colored gems in the jewelry market. There are so many gems out there that are clear, valuable in their own right and make very beautiful pieces of jewelry. Many jewelers mix and match stones creating rings that may have a large carat weight white topaz surrounded by small diamonds or another clear gemstone. Before deciding which gemstone appears more diamond-like, let’s find out where they come from and what kind of qualities each has. Without getting too technical and confusing, topaz is formed from granite rocks that contain more minerals than your average vitamin. In the purest form, topazes are naturally white or clear. Most, however, are tinged with color. They are found in many parts of the world, including Brazil as shown by this raw beauty here. Topaz is classified as a mineral gemstone because it contains fluorine and aluminum. Many of our coveted gems are mineral gems. Isn’t the earth clever? Even though I call them white sapphires here, in jewelry lingo they are really colorless, not white. The colorless versions are also called corundum. Most of the world’s sapphires come from countries like Thailand, India, Myanmar and Africa. Because they are on the rare side, there is a bigger market for the lab-created varieties. If you see a super-cheap white sapphire ring somewhere, it is probably going to be a simulated one. 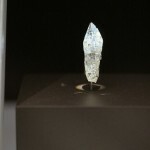 The beautiful colorless one shown here was found in Sri Lanka and remains a museum piece for gem lovers to admire. As you can see, a sapphire is much more expensive than a topaz. Considering that a sapphire is almost as hard as a diamond, it makes for a durable choice in an engagement ring. However, I have seen some gorgeously sparkly topaz rings on Pinterest that were cut and polished to perfection. White Topaz Vs White Sapphire-Who Wins The Sparkle Test? Which one would you choose? They both have beautiful shimmer. The sapphire is going to cost much more than the topaz, but comes in a close second for diamond-like hardness and durability. 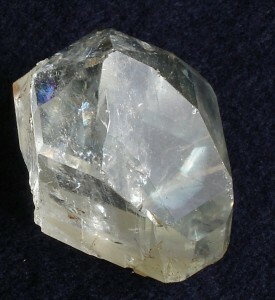 Topaz is much more affordable which means you can get more carat weight for the money, but it isn’t as hard as Sapphire. If your budget allows and you need to make a serious decision between the two, go for the sapphire. Or the topaz. Or both. Clearly, both have the potential for a great fake diamond option. If you decide to buy a white topaz or sapphire engagement ring, it’s up to you whether you want to correct your friends and family when they drool over your luscious new diamond ring. Or, you can simply let them think what they will. All gemstones have heartfelt value and beauty simply because Mother Nature created them from the mysteries of the earth. Like the ladies in the videos above, they display their rings with pride and they should. Sapphires and Topazes are gorgeous gems. The traditional engagement ring and wedding band design is only as traditional as our own unique tastes. Couples are choosing a multitude of different styles, settings and stones these days helping to take the pressure off having to have a real diamond instead of something else just as meaningful. For you gemstone fans: The Gem Geogallery of The Smithsonian National Museum of Natural History in Washington D.C. gives you a great idea of the range of colors they come in. See the sapphires here or view the topaz grouping here.